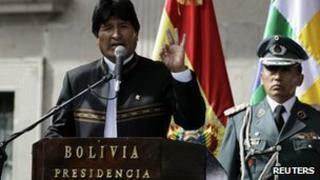 Bolivia's President Evo Morales has renewed his calls for the release of three soldiers arrested in Chile. The soldiers were arrested in January after crossing the Chilean border carrying an assault rifle. In a speech marking the 134th anniversary of the war in which his country lost access to the Pacific Ocean, Mr Morales called the men "great defenders of the sea". It was the first time in decades that a Bolivian leader celebrated the event. Chile says the men were detained after entering the country illegally, while Bolivia argues they were following car smugglers as part of an army operation. Bolivia said it would appeal to an international court if Chile did not release the soldiers. Mr Morales accused Chile of making "political decisions" rather than ones based on law. "As we claim our sea issue, Chile wants revenge [for it]. Our soldiers are great heroes of the sea and we will never abandon them," said the Bolivian leader. Landlocked Bolivia has a long-standing claim over sea access. On 14 February 1879, Chilean forces took over the then Bolivian port of Antofagasta in a dispute over valuable nitrate exports. For years, Mr Morales has been calling the border issue an "open wound". The current borders were set by a treaty signed in 1904, after Chile won the war. This was the first time in decades that a Bolivian leader also used the anniversary of the invasion to claim the lost territory. Chile is involved in a similar dispute over maritime boundaries with Peru, which also lost territory in the War of the Pacific. In 2010, Peru signed a deal allowing Bolivia to build its own port on Peru's Pacific coast. The demand for the return of its lost coastline is the subject of powerful national sentiment in Bolivia. The landlocked Andean nation maintains a small navy, and schoolchildren are taught that regaining access to the sea is a patriotic duty.